What a fluke! Academics, media professionals and experts met this week to push for a course on safety for journalists as a coalition of concerned stakeholders urged U.S. Secretary of State John Kerry to uphold a pledge he made last year to defend their security. 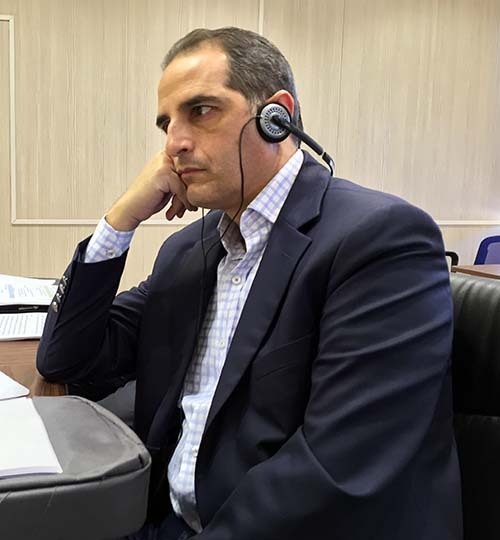 "This is a reminder that no journalist is safe in our world today," said George Awad, communications and information program officer at UNESCO's Beirut office in opening remarks at the conference in Lebanon. 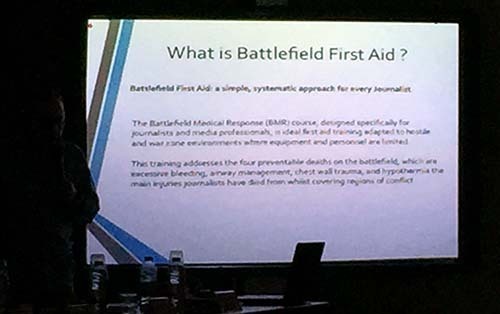 He added that journalists had an obligation to stay safe and that the event aimed at empowering would-be reporters and correspondents to get a better grip on safety issues while providing academic institutions with a road map through a course to be incorporated in their respective media-related curricula. The conference is a follow-up to last year's launch in Jordan of the initiative in collaboration with the International Federation of Journalists (IFJ). "Students of journalism must understand the risks they confront when they work," noted IFJ President Jim Boumelha. 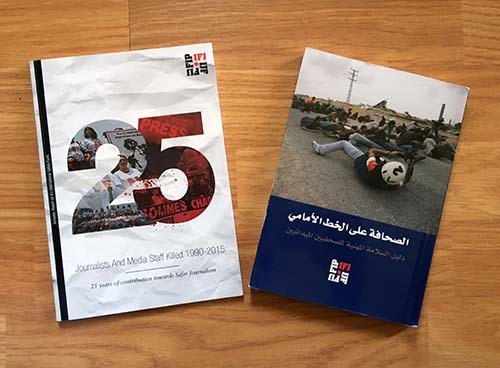 The IFJ produces an annual report of media casualties, added Boumelha, saying most of those targeted are local journalists whose names get tepid reactions and don't resonate in the media, unlike the spotlight shed on foreign correspondents and the attack on the French satirical paper Charlie Hebdo that caused worldwide condemnation. The Beirut conference dovetails with the goals of the "U.N. Plan of Action on the Safety of Journalists and the Issue of Impunity." 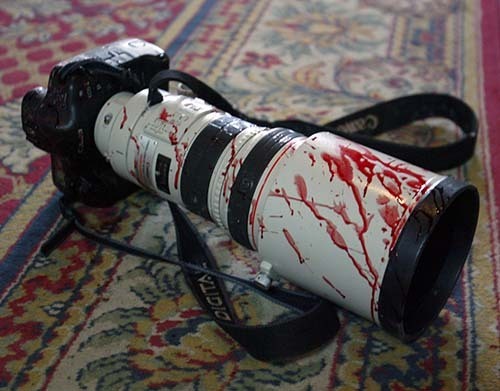 It came 10 days after UNESCO held a conference on "News Organizations Standing Up for the Safety of Media Professionals" at its Paris headquarters that drew some 300 international media leaders focused on safeguarding their staffers and ending impunity for attacks against them. 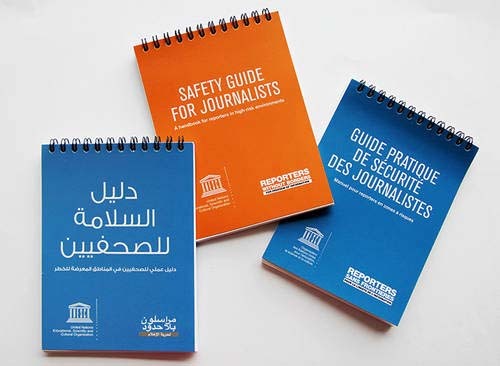 UNESCO reissued its safety guide for journalists in English, Arabic and French for that gathering. "We welcome the commitment you made to create a "roadmap" for the State Department's work on journalist safety and the additional resources that have been provided to the S.A.F.E. Initiative for safety training for local journalists. However, we are concerned about progress on the three other commitments that the State Department made in the conference summary and next steps document: more fully integrate the issue of impunity against journalists into the U.S. bilateral and multilateral agenda; develop worldwide protocols within the U.S. embassy community on when and how to provide assistance to journalists working in conflict zones or other hostile environments; and coordinate with relevant countries on possible exemptions for accredited journalists carrying protective gear across international borders. We would welcome an update from you on the status of these initiatives and actions that have been taken over the past year." Meanwhile, academics from Lebanon, Syria, Palestine, Jordan, Egypt, Iraq, Tunisia, Morocco and Oman went over a draft of a semester-long course to be taught as one required unit, as an elective, or, from which they can select components to incorporate in other relevant media courses. Educational systems differ across the Arab world where public and private universities exist and the language of instruction is mainly Arabic, but where professors also teach in English and French, depending on the country. The course syllabus includes an overview and raison d'etre for safety as well as content on planning and personal safety, risk assessment, travel security, health and health care in hostile environments, demonstrations (and riots), natural disasters, gender safety, digital security, ethics, international humanitarian law, and safe investigative reporting. "We can build on this and add workshops as supplements to the course," said Hassana Rasheed from the state-run Lebanese University's Faculty of Information. Speakers included a security expert as well as four noted Lebanese journalists - two who work locally and two whose international track record in covering conflict zones is legend. "News organizations should train journalists and insist on safety measures and the use of proper equipment," said Yazbeck Wehbe, a veteran of LBCI TV News who also teaches journalism at several Lebanese universities. But given the turbulent nature of events in Lebanon, students and professionals are often better off not wearing gear or signs identifying them as journalists so as not to be targeted, he explained recounting some of the close shaves he's had with danger. Patrick Baz (a/k/a "Boom Boom" Baz), a world-renowned photojournalist whose career is linked to Agence France-Presse (AFP), offered valuable insights on how he covered some of the hottest spots in the Arab world and what lingering impact it's had on him. 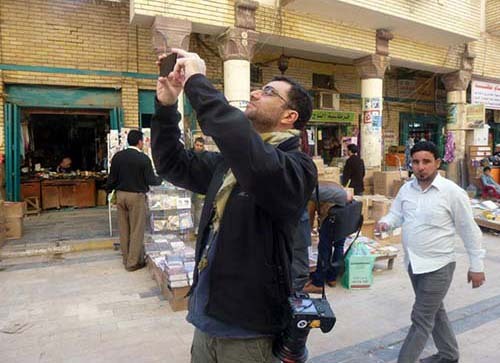 On one occasion in Baghdad in 2013, he was told he couldn't use his professional camera to shoot in a public place but that it was OK to snap away with his iPhone, which seemed less threatening. Little did his interlocutors realize he could take professional quality shots that got equal billing on the news wire. "Being a correspondent is going to places and sometimes bearing witness to war crimes," said Samia Nakhoul, a Reuters veteran and Middle East bureau chief who was seriously injured and almost died when U.S. tanks lobbed shells into the Palestine Hotel in Baghdad where foreign media were based during the 2003 invasion of Iraq. She was on the balcony of the Reuters office and went from being a correspondent to being a victim. Her cameraman was killed. "I can't stop thinking about all those who died in the line of duty. The risk is there and we need to raise awareness," she said of the resultant trauma, which in the past was a taboo subject. 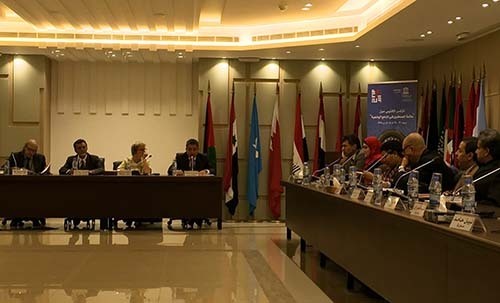 News organizations should provide trauma counseling as well as safety training while universities should equip their students with the requisite knowledge and skills to face all manner of hazards, Nakhoul said. For Karma Khayat, the vice chairman of Al Jadeed TV, there's an urgent need for cooperation among all institutions to lessen the dangers journalists encounter. "If there's a course, there are things we can mitigate, or avoid, but it's not 100% guaranteed," she said.